African Dog Rose, Turkish Rose Absolute, Cashmeran, Musk, Sandalwood. 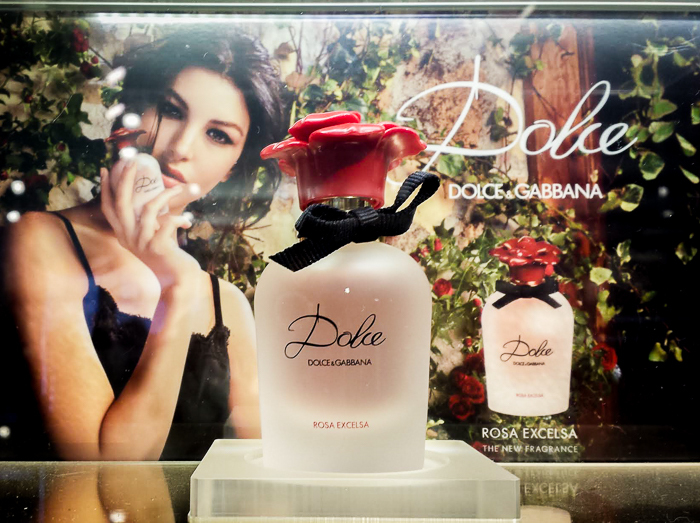 Dolce & Gabbana perfumes are among my favorites, so when I spotted the new Dolce & Gabbana Rosa Excelsa at Sephora I had to give it a try. It is housed in a frosted glass bottle topped with a red rose cap, and the perfume itself is a pale pink, all tying in neatly with the romantic rose theme to this perfume. The fragrance is described as a fresh floral, and a lot of white florals mixed with rose absolute form the majority of the notes. Dolce Rosa Excelsa opens with a sharp, crisp note mixed in with the florals. Despite the name, I didn't find the rose note to be too prominent, though I could detect it mixed in the floral notes. The warm musky, woody notes linger in the background while the florals stay prominent. I am not a fan of overwhelmingly floral perfumes, so the Dolce Rosa doesn't isn't a must-have for me, but it is a simple crisp floral that would work well for the summers. The fragrance isn't overwhelming/strong, and the scent lasts all day on my skin. If you like Dolce & Gabbana perfumes, give this a try the next time you are at Sephora. Links provided for information only and are NOT affiliate/sponsored links.